We interupt the Jordan series of blog posts because of yet another copyright infringement of my photos. This time the international hipster camera company lomography.com are the ones who think copyright law doesn’t apply to them. 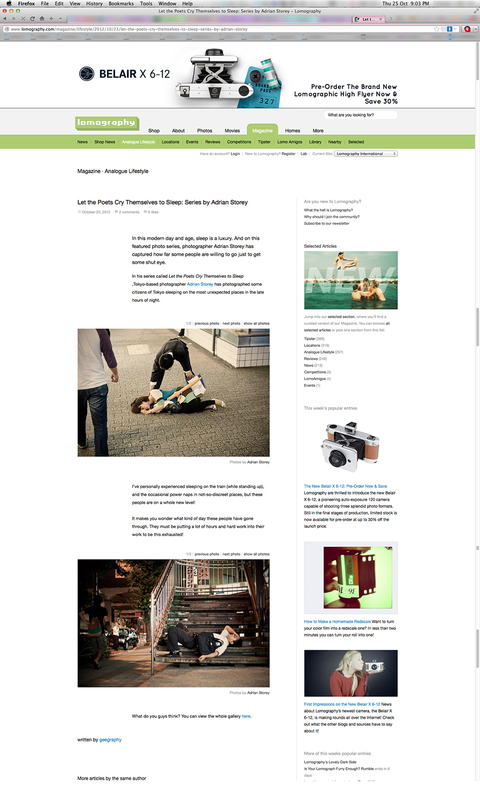 lomography.com used 5 of my pictures in their magazine without my permission. I sent them an invoice and an email explaining that their use was theft. They took the page down and the chief of the online magazine emailed to say “I apologize for any unintentional inconvenience” and tried to shut me up with the offer of an interview in the magazine that had just stolen my pictures. What is it about these people that makes them think I will be so excited to be featured in their ridiculous hipster magazine that is going to make me forget about their law breaking? No offer of payment was made. The fact that a large international company that markets itself as a cool, hipster camera and film company thinks its ok to steal copyrighted works disgusts me. The law is perfectly clear. Lomography.com you stole my pictures in breach of copyright law. Now pay me – or at very least compensate me for the infringement.